We now have Butterbeer ice cream thanks to Yuengling Ice Cream. You no longer have to travel to the Wizarding World Of Harry Potter to fill your Butterbeer cravings, because you can now simply pick it up at your local grocery store! If you are a true Harry Potter fan, then you are going to be obsessed with this ice cream. The delicious pint is made with half buttercream ice cream, half butterscotch ice cream, a pinch of felix felicis, and is twisted with a butterscotch swirl. DROOL! And it's all thanks to creator David Yuengling. And in a statement shared by Time Magazine, he added, "We are always looking for ways to inspire our fans and spark creativity. Whether it's our flavor names and descriptions or the recipes themselves — we’re in the business of having fun. ... We hope we made J.K. Rowling proud with this flavor." The flavor can be found by the pint at many local supermarket chains and retails around $3.69 to $3.99. 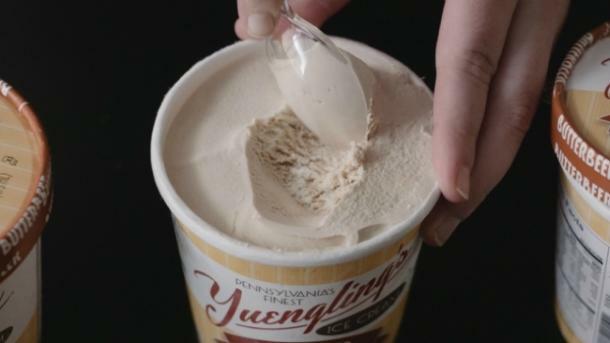 The flavor will be a regular flavor of Yuengling’s Ice Cream 20-flavor lineup. If you plan to apparate to your local supermarket for a few (dozen) pints, you can check out which retailers are currently carrying the brand online. So let's all raise a cone of butterbeer in hopes that grocery store versions of these treats will follow soon!